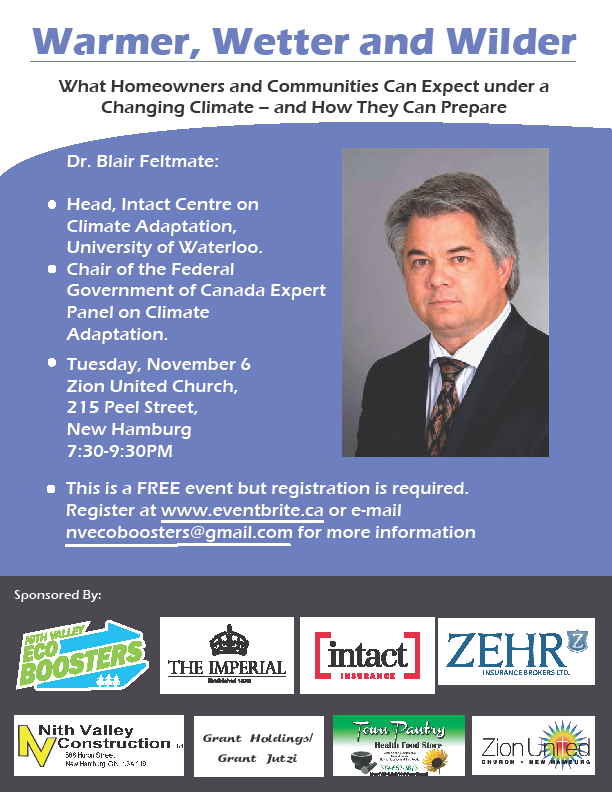 The Nith Valley Ecoboosters are pleased to present an informative and timely talk featuring Dr. Blair Feltmate. Dr. Feltmate is Head of the Intact Centre on Climate Adaptation at the University of Waterloo. He has written textbooks on environmental science and sustainable development and is involved in the creation of several national climate adaptation Standards involving the National Research Council, Standards Council of Canada and the Canadian Standards Association. Blair is also Chair of the Federal Government of Canada Expert Panel on Climate Adaptation. Significant damage from high winds, heavy rain and floods is becoming a more frequent occurrence. Members of our community need to know how to protect themselves and their property so that the effects of severe weather can be minimized. Dr. Feltmate will begin his presentation by establishing that climate change is real, and is causing extreme weather events – particularly in the form of flooding. This “new normal” situation has proven to be costly for all regions of Canada. In an effort to help limit future losses, the discussion will then address practical and cost-effective steps that home owners and communities can take to lower their flood risk profile. Dr. Feltmate will be happy to take questions from the audience throughout his presentation. Doors open at 7:00PM and the presentation will begin at 7:30PM. Light refreshments will be served at approximately 8:45PM.